Industrial machinery and components manufacturers are facing increasing pressure to provide innovative, customer-specific solutions at competitive prices, and the specialization of customer requirements will only continue to grow. Despite not having detailed cost and product information at the initial stages of new-product design, manufactures still need to have preliminary cost estimates. This is relevant for all companies that require cost information for a product that is being newly designed or that is planned to be the successor or a new version of an existing product. Manufacturers want to evaluate the potential cost elements, breakdown, and drivers that typically will iterate towards target costs, along different milestones in the development project. Designing and building complex products to exacting customer specifications frequently involves heavy engineering work. To ensure consistency of sub-assemblies and component parts costs across all finished products, the cost structure should be modularized by referencing the cost estimates of the parts that are used in different products and components multiple times, or in different variants of the same product. Additionally, industrial manufacturers are often challenged by diverse business processes and data sets across the organization, as well as diverse system landscapes due to organic growth as well as M&A activities. In this situation, it is essential to optimize costs through simulation and evaluation of production or supply costs, as well as improve the cost structure of the organization. However, cost experts often spend their time on gathering data rather than optimizing costs. AGCO is an international manufacturer of professional farm machinery that helps boost agricultural productivity and reduce post-harvest waste. AGCO’s next generation solution for precision agriculture connects the entire crop cycle from enterprise planning to planting, crop care, harvesting, and grain storage. The company’s well-known brands, such as Massey Ferguson, Challenger, GSI, Valtra, and Fendt, are all built around the globe and sold through a network of over 3,000 dealers across all regions. AGCO has multiple engineering design centers in North America, South America, Europe, and Asia Pacific as well as more than 20 manufacturing locations worldwide. AGCO is constantly innovating – designing new machines while improving existing products. The development cycle from inspiration to implementation in the farm field is typically two to five years depending on the complexity of the project. For AGCO, 80% of the product cost are determined during the design stage. One of the last, untapped cost optimization potentials resides in the early costing process. AGCO is challenged by diverse business processes, data sets, and system landscapes due to their growth by acquisition. Due to multiple software systems and legacy tools, the costing process is highly manual and error-prone. Aligning product costing with design, sourcing, and manufacturing is challenging since all of these lines of business must be coordinated across multiple sites for the same product. Again, because of the complexity involved the cost expert’s time is spent gathering and analyzing data rather than looking at strategic ways to optimize cost. To get a consistent and transparent view on product costs, the company needed a single solution that addresses multiple locations and companies, offering a great user experience and high efficiency. AGCO’s goal is to be able to design anywhere, build anywhere, and do so as efficiently as possible. 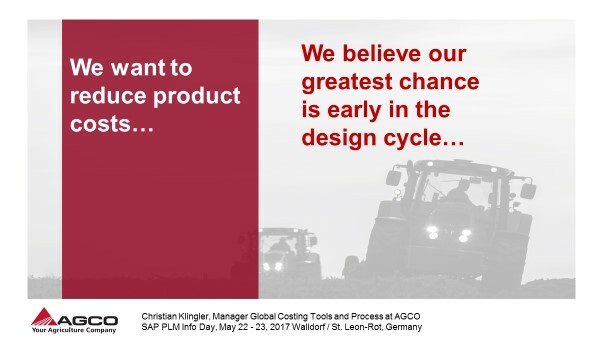 To help reach this goal, AGCO recently implemented the SAP Product Lifecycle Costing solution, which is helping them establish a single global methodology for tracking and analyzing new product costs that it can use at any of its design and manufacturing locations worldwide. SAP Product Lifecycle Costing is integrated with AGCO’s several ERP and engineering systems. 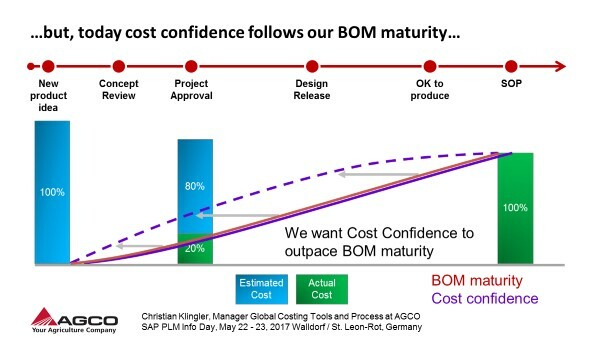 The direct integration to design bills of materials (BOMs) and the integration to SAP master data are essential to leverage the engineering and enterprise data early in the product development process. Powered by the SAP HANA platform, SAP Product Lifecycle Costing enables high performance and excellent transparency across AGCO’s complex structures. 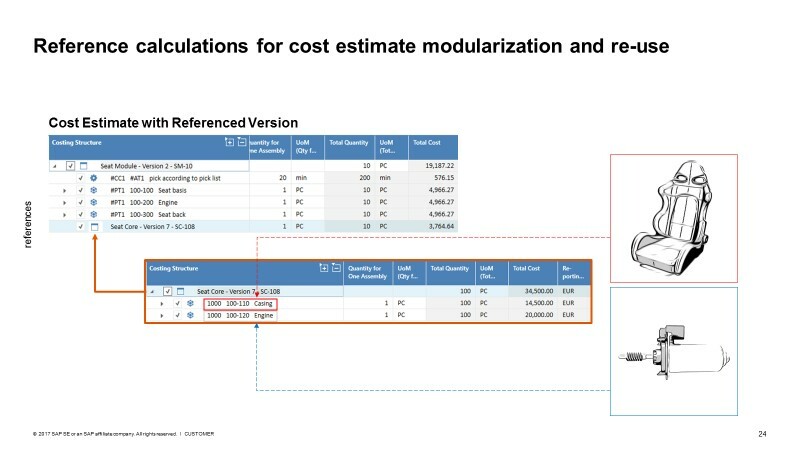 Furthermore, AGCO uses the reference calculation capability of the new solution to modularize cost structures by referencing cost estimates of parts that are produced in-house or intercompany and used in different assemblies and products, as illustrated below. This new solution also helps AGCO achieve target product costs during new product development projects. With their new global costing solution, AGCO now has a single standard costing process in place that helps improve target cost achievement and helps significantly reduce product cost for new projects. Furthermore, the increased efficiency of their cost engineers gives AGCO more time to evaluate design concepts and make better business decisions. Read more about how AGCO is improving product cost accuracy and profit margins with SAP Product Lifecycle Costing in their Business Transformation Story. Listen and watch Nita Luiz, Senior SAP Product Lifecycle Management Analyst at Varian Medical Systems, explain how the company is using SAP Product Lifecycle Costing to strengthen the company’s ability to innovate and perform at a high level in an ever-changing business environment. Varian is also currently implementing SAP S/4HANA. https://youtu.be/fbAZrXJU6lg. Marion Heidenreich is working in the SAP Industrial Machinery & Components Business Unit focusing on Finance, Procurement, and Business Networks. With almost 20 years of SAP experience, Marion is well versed in business development, solution management, and go-to-market strategies for discrete manufacturing industries.